“Great, now I’m going to lose weight”. August 24, 2008. I had my world rocked yesterday. I blogged about it, but just not ready to have all the world see it. Then, I read the entries here. So serious. A little pretentious. Who the hell am I? Who am I trying to be? My husband actually noticed that I smiled the other day. How sad is that – that I smile so little that he actually notices — and COMMENTS — on the fact that I smiled? And yesterday, I got out a cookbook for the first time in –well, a long time — and he said it was nice to have a real dinner. Ugh. I’ve been beating myself up over all the weight I’ve gained. If I spent a fraction of the time I spend thinking about how unhappy I am with my body actually DOING something about it, I would be skinny. I have these grand ideas about how I will work out everyday…I have the time…I have a membership at the Y. But, I have all of these excuses about why I don’t go. The most ridiculous one? I’m too fat. I will go to the Y when I have lost weight so people don’t see me fat. How messed up is that? But, this one takes the cake….I realized the other day that comcast has workouts “on demand”. JACKPOT! I can work out at home without getting bored with the same old workouts (and get in shape before I go to the Y). What did I do? Sat on the couch and watched an entire workout to see how hard it was. AAAARRRRGGGHHHHHH. If the 27 year old me saw the 37 year old me, she would think she was pathetic. She IS pathetic. And starting today, I am going to do something about it. My goal today is to smile at my husband when he comes home. Because he really is a great husband. He loves me no matter how crazy I am, no matter how much I weigh and he just wants to make me happy. He needs to know that he does make me happy. I know we’ve all had an occasion where we have sat in church and felt like the pastor/teacher was speaking directly to us with a particular message. Today was one of those days for me. Plain and simple, God rocked my reality today. I expected it to an extent. It had already been a rough morning and that is always a sure sign that I need to be in church. And those are the days I am most nervous to walk through the door. And, He is usually very gracious — gently nudging me. Today in his graciousness, he whacked me with a two by four. And, I am sincere when I say it was gracious….because it is exactly what I needed. It started with a conversation with a friend – he was telling me about an area in his life that God had been speaking into and healing him. Tears welled up in my eyes as I realized that God was holding up a mirror to me as if to say “This is you, Stephanie. And, I can heal you too”. So, I’m already weepy and the music hasn’t even started. It’s going to be a long morning. The teaching was from Acts 2….and the discussion centered around how the disciples of Christ formed a community that’s sole purpose was to spread the gospel. There was a lot more than that, but as I was listening, God was telling me that I’m never going to be able to do any of what he has created me for until I get out of the way and stop being so prideful. I have spent a lot of time judging others for being prideful and here I am….maybe the worst among them. He went crazy. Stark raving mad for 7 years. He was cut back to a stump (just like the dream said he would be). And, then…in his graciousness, God restored him. I remember hearing someone talk about this passage once saying that this was a lesson you wanted to learn in the classroom and not on a field trip. I laughed and thought, “Yeah, I think I’ve got that one – God isn’t going to have to teach me not to be prideful”. But, here I am — feeling like I’ve been cut down to a stump. Realizing that the areas that I have felt “attacked” is just me allowing myself to be attacked by not repenting of my sin. And, instead of taking any responsibility, I have just been acting like a victim. But, God has shown me my sin and what I need to do. And He has promised me that He will help me. And, that is very good news because I cannot do it alone. As we planned our trip to Tennessee, we knew that we wanted to add some extra days on to the end of the conference dates to enjoy just being a family together. We had three choices: 1) Stay in Nashville and explore further, 2) Go to Memphis or 3) Drive east and visit the Great Smoky Mountain National Park. 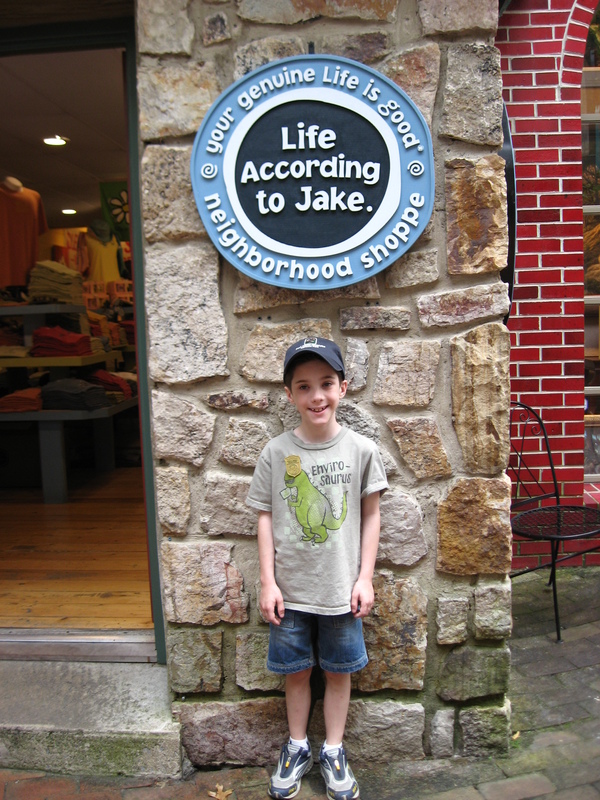 We chose 3 for a variety of reasons – not the least of which is that Jake has decided he wants to visit every National Park in the county….which would make his Great Grandfather proud. 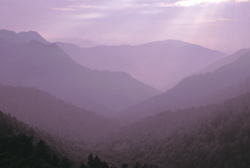 We had also heard of the great beauty of the Smoky Mountains and I really wanted to see it for myself. It is beautiful, to be sure. And, we learned all about how and when the Smokies were formed (before the dinosaurs!) and why they came to inhabit over 1000 species of plants and animals….many of which are not found anywhere else in the world. But, I found myself being a tad disappointed and I couldn’t really figure out why. And, then it hit me. I already LIVE in one of the most beautiful places in the country. I get to see amazing beauty every day. 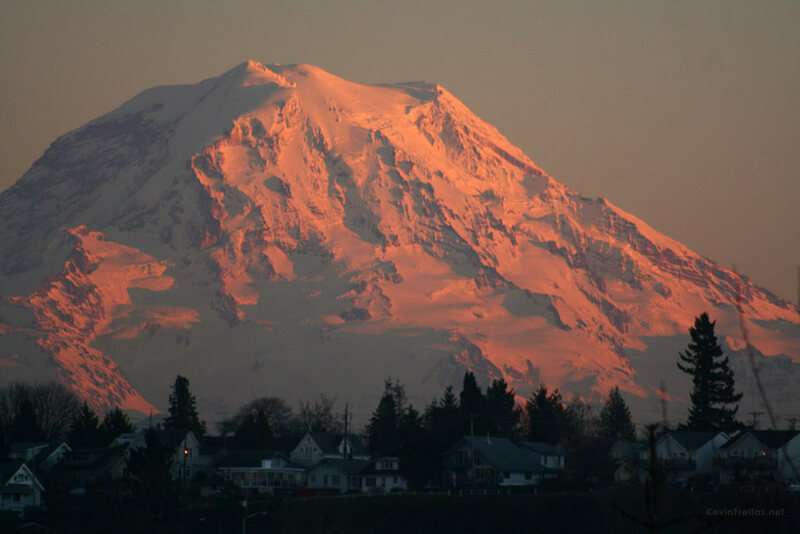 When Mt Rainier is painted majestically against a brilliant blue Northwest sky, it never fails to take my breath away. And, it took me a while to appreciate even this….because I grew up in Colorado…where from the top of Gold Hill Ridge (12,725 ft) in Telluride, you can see the red rocks of Utah. I almost found myself snickering when I heard that the highest peak in the Smokies is a mere 6,600 feet. But, then I learned that they are perhaps the oldest mountains in the world…formed 200-300 million years ago. It’s mind-blowing to think about. I started to try and imagine what they looked like back then. Maybe they were similar to my beloved San Juans, who are mere babies in comparison (formed about 30 million years ago). It tells me that God is continually creating and recreating…and what an amazing artist He is! That’s what Jake told me a few weeks ago when I was asking him to please practice the piano. I told him that I thought he meant “practice makes perfect”. Instead he responded, “Nobody’s perfect, Mom. Only Jesus”. Lloyd told me that one needed to be written down. And now it is…the continuing saga of what I’m now going to call “Life According to Jake”. We have spent the last week in the South. Lloyd had a conference in Nashville and Jake and I accompanied him on the trip. Since he would be occupied with meetings, we took the opportunity to visit friends on Birmingham for a couple of days. We decided to take the kids to the Civil Rights Museum. I’m not sure what I was expecting…..or perhaps I wasn’t expecting the reactions we had. To start, the friend I was with is married to an African-American and her son is bi-racial. At one point, Jake turned to me and said, “Mom, of it weren’t for people like Martin Luther King, Jr. and Rosa Parks, I wouldn’t be able to play with Brandon!”. He’s absolutely right and I was so happy that he was really “getting it”…after all, that was the point of the museum. He became increasingly indignent as we proceeded through the museum….asking me WHY we would treat people this way. WHY on earth would people burn crosses when the cross was a symbol of forgiveness and freedom from sin? I didn’t have a lot of answers for him. But, I was proud of him for feeling such empathy. 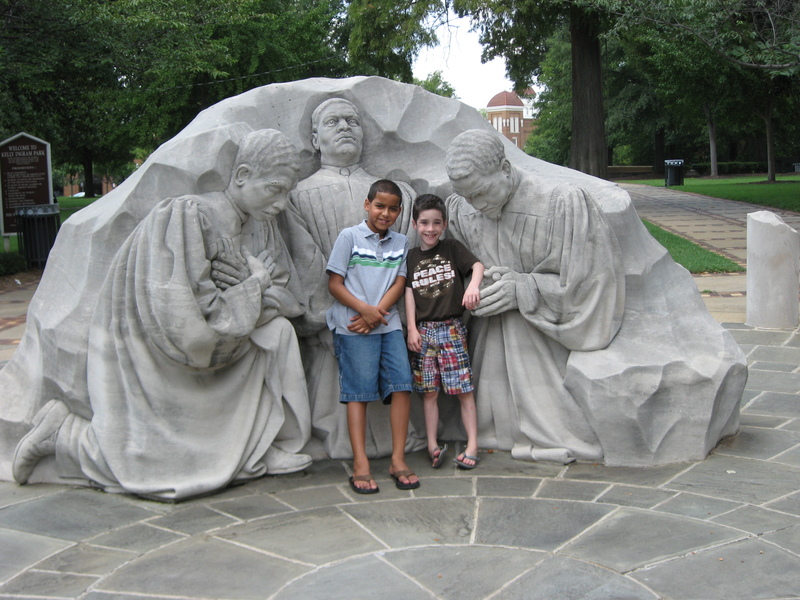 At the end of the tour, we got to hear/see MLK’s I Have a Dream speech and Jake applauded throughout. As for me, I was equally as appalled. And I wondered to myself if I would have been one of those that cheered on the Freedom Riders as they made their way toward New Orleans. Even more….would I have been willing to endure the persecution. I like to think that I would have been. So as we look forward to hearing Barack Obama’s speech at the DNC ( which, incidentally will occur on the anniversary of the I Have a Dream speech), I am even more hopeful for our country…and for the America that Jake will have the opportunity to experience.